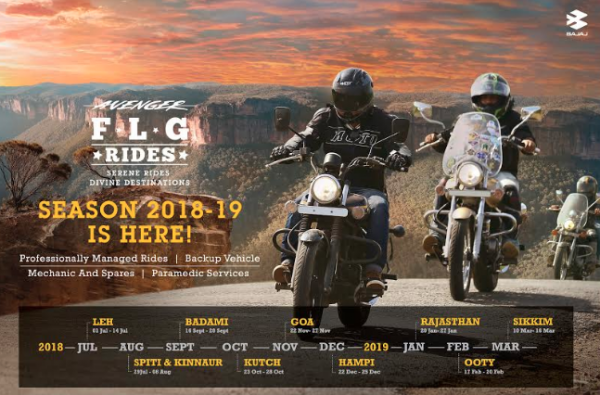 Bajaj Auto, India’s leading motorcycle manufacturer has kicked off season 2018-19 of Avenger FLG Rides – a pan-India riding initiative, exclusive to Avenger owners. These serene rides to 9 iconic destinations are designed to give riders a divine liberating experience. With this, Bajaj Auto is enabling consumers to live Avenger’s brand promise of liberation articulated as ‘Feel Like God’. Avenger FLG Rides has an uncompromised focus on safety & security of riders, and are supervised by seasoned riding experts. Each ride is led by a professional rider, accompanied by a support vehicle and a certified paramedic with medical equipment. Bajaj Auto bears all the support costs while the participants bear only the fuel and the boarding costs ranging from 1300/- to 2200/- per day depending on location. Long distance group riding has grown incredibly in recent years across India. Avenger brand stands for riders’ liberation articulated as ‘Feel Like God’ and these FLG Rides represent this value. It inspires the riders to break free from the mundane and get the best experience out of their Avengers. With Avenger FLG Rides, we want to encourage our valuable consumers to experience leisure riding to these breath-taking destinations. FLG Rides has been uniquely designed with resources and infrastructure that promotes group riding in a safe and professional manner. Apart from FLG Rides we have engaged over 10,000 Avenger owners through weekend rides & community get together.